Slowly lift R leg a few inches away from floor without altering neutral position. Hold ____secs, Repeat ____x both legs. To challenge yourself, raise opposite arm above head while raising foot. To challenge yourself, cross arms over chest and rotate trunk to L while raising R foot. Lie on tummy on ball with weight supported through arms and toes. 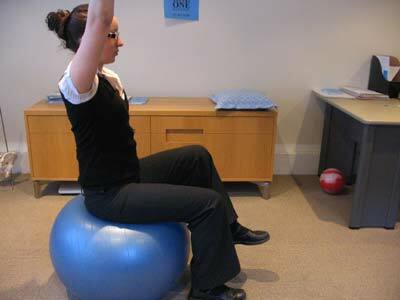 Tighten deep abdominals and slowly extend opposite arm and leg so that they are in line with your spine. Hold ____secs, Repeat ____x on both sides. Lie on back on floor with legs supported on ball. Keep arms supported on floor or cross arms over chest to challenge yourself. Tighten through deep abs and squeeze buttocks. Lift buttocks away from floor keeping pelvis and hips level. To further challenge yourself, perform as above, but raise one leg away from ball while ensuring hips remain level. Lie face up with upper back supported on ball. Keeping hips level, raise ____ foot a few inches away from floor. Hold____ secs, Repeat ____ x both sides.